Traditionally, these tasty nibbles pair perfectly with after-work beers, but at lunchtime, Umi offers its nine small items, priced individually — from broiled black cod to dancing scallops (each $8.95) — as a “lunch special.” An additional $2 will get you a choice of soup or salad and a bowl of rice. Only those with a very small appetite would be satisfied with just one item, however. Dining with a friend, we selected four of the izakaya items to share (I later wished we had ordered a couple more). We each started with the salad, which was more substantial than the typical iceberg variety and came with a bottle of really good ginger dressing for dousing at will. Next to arrive was the BBQ short ribs ($6.95), tender little slabs of sweet-soy saturated fatty beef that looked adorable piled up on a doily and topped with a cocktail umbrella. The flavour was great but I felt they needed to stay on the grill for another minute or two. 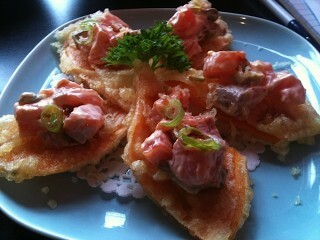 Fun fusion: sushi nachos combines silky salmon tartare with crisp tempura sweet potato. Next came agedashi tofu ($5.95), deep fried hunks of silken tofu in warm dashi with slivers of pickled ginger; pure comfort. Then, the wild card: sushi nachos ($6.95), which was a generous dice of sweet-mayo slicked salmon tartare served on wedges of tempura sweet potato. Move over sushi pizza, this combo of crispy cooked and silky raw works wonderfully! The best dish, we both agreed, was the takoyaki ($5.95), traditional golden octopus balls — a popular Japanese street food. 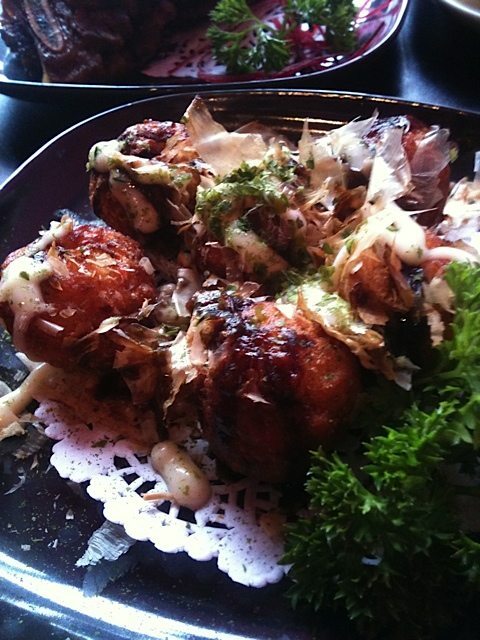 These habit-forming snacks are rarely found in Ottawa so here’s your chance to try these creamy fried spheres filled with a tiny dice of octopus and topped with dancing smoky bonito flakes and several squirts of umami yumminess. As addictive as they should be. 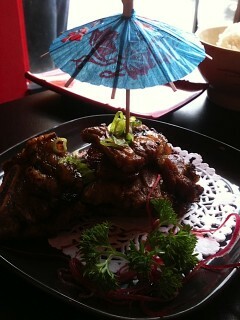 Sushi Umi, 1311 Wellington St. W., 613-724-2488.